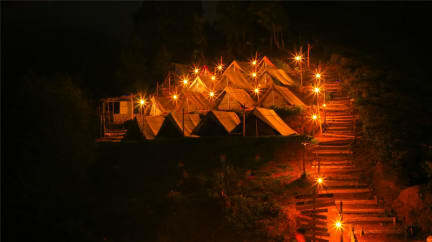 Perched at an altitude of 2000 MTS above sea level, camp is in the middle of 4000 hectare of tea plantations. The camp offers panoramic view of the western ghats, rolling tea plantations and the clouds filled valley on the Tamilnadu side. This place was phenominal! It is a bit of a journey to reach the camp but it is an adventure and entirely worth it! The staff will arrange everyrhing you need to reach the camp. Niyaz has exceptional knowledge of the culture, area and india in general. You have the freedom to lay in a hammock and enjoy the view or to socialize with other guests and staff. The camp spot is in an amazing spot 2000m high in the middle of tea fields. The early morning sunrise was incredible, the food and staff was great. Would recommend to anyone wanting to experience a different side of Munnar. Based on the landscape and setting alone this is our best time in India by far. The staff are friendly, passionate and laid back, whilst constantly present and keen to ensure you're looked after. I can not recommend it enough. A great experience and one of the highlights of my time in India. The location and scenery is stunning, the night sky incredible. Sitting around a campfire, good food and company. The sunrise and tea plantation trek were brilliant. It's cold so wrap up warm. Also, it's a bit of a mission to get to, but definitely worth it. This was the highlight of our 3 week trip to India. The jeep ride shouldn’t be underestimated - it’s a good 20 mins on super rough terrain but once you reach the camp the views are absolutely stunning and you’re welcomed with tea and a chat with the guide about the history of the tea plantation. The guides and hosts were so fantastic - so attentive, kind natured and good fun. The sunrise was so special and I would recommend this campsite to everyone. Oh and the food was good! The view is breathtaking. Loved being in the mountainous terrain. 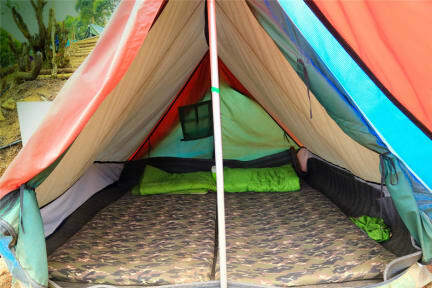 This is camping so don't expect restroom facilities or glamping. It was fun to see how the tea on the plantation is picked and processed. Great staff and food! The location is really off the map.